I posted this on my Facebook page and received many comments and likes but I also received quite a few private messages with stories from women who were trying to learn not to take things personally. This was coming on the heels of the Kelly Clarkson body-shaming tweets so I thought I’d respond with what I’ve learned. First off, there are mean people out there. They have no filter. They mask it under the, “I just say what I think you know? I’m just being honest.”, only their honesty is aimed as the knife that stabs you to your core, and remember this, their honesty only pertains to the output not the input. In other words speak the truth to them and it’s WAR. Not everything needs to be said but so often we think what we have to say is important, because it is important to us. No one is exempt from this not even me, hence this post. Compound that with the phenomenon of social media where because we can’t see the hurt look on someone’s face it is easy to blast people. These are your typical pounce and flounce people at a new level. I have a friend who seldom replies to online posts because she says the attacks begin immediately and sadly she is right. Listen, you’re not going to be everyone’s cup of tea. Friendships happen with like-minded people. Leave it at that. I often hear people say, and I’ve said it myself, the solution is to go and confront the person but the problem with that is that those who talk behind your back never say it to your face so oftentimes my experience has been that I’ve gone to the person and asked if there is an offense because I’ve heard such and such from so and so, I get the standard answer of nothing is wrong it was a misunderstanding, and more often than not, the pattern continues. So here is a pattern that I chose to live my life by, and so far it’s working, so let me post it and hopefully help you. 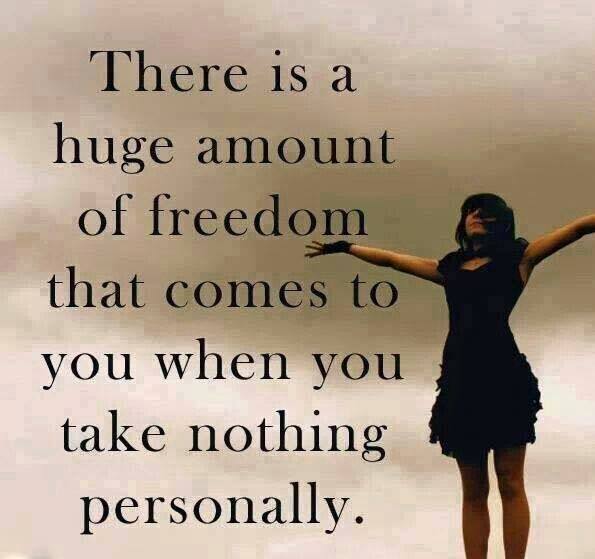 I no longer take it personally. The comments, the blasts, the opinions, come from people who don’t know me. It’s okay. Those comments and opinions don’t pay my bills nor do they pour my cup of coffee in the morning. I have a choice to snuggle with those opinions in bed at night or kick them to curb. I choose to boot them out of my life. I hope you’ll try it because you’ll find your life is a lot less messy.